Paratus Familia Blog: Another article in Backwoods Home! NoCal Gal, this is for you! 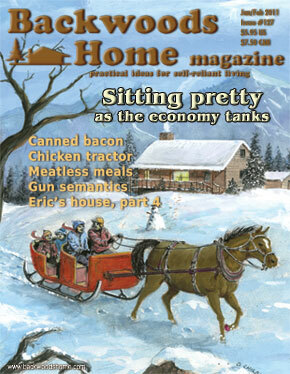 I just received my new issue of Backwoods Home Magazine, and the article I wrote on canning bacon is in it! But what's more, the Backwood Home website has the article, in its entirety on their website! I am so excited to be published that I wanted to share it with all of you! I'll have to give this a try. I LOVE bacon. We're all very proud of you, but not at ALL surprised. Enola! Congratulations! Love the article and LOVE YOUR BLOG! Wishing you and your precious family a very Merry Christmas and a New Year filled with love, joy and adventure! Enola Gay, that is so very wonderful! I'm jumping for joy (you know how big I am, the Richter Scale is probably going crazy at the USGS). You have a natural knack for writing. I realize you're a very busy woman, but please submit more articles to magazines when you can. I'm going to read the article now. I can't wait!! I'm so excited for you! This is great! OK, just finished reading the article. The title is very clever! I am a lousy cook, but that article made canning bacon sound so simple that I think even I could do it (if I had a pressure canner). That's the trademark of a well written article. Again, I offer my congratulations. This is just the beginning of your freelance writing and photography, I have no doubt about it. I bet your family is very proud of you!! I have always just rolled up naked bacon and stuffed it in the jar to can. Yes, it comes out as a tender tangled mass that you can't make strips of, but I never minded the crispy 'mat' you end up with once it's fried. I'm going to try your method, though. It makes it more presentable, especially if there is company. Congrats! & Merry Christmas to you & your family! Great article- I canned bacon within a couple days of reading it...it still tastes like bacon...I'm just having trouble getting it to remain like bacon- ending up with bacon bits and smaller bacon pieces. Maybe I'm cooking it wrong? I used thick bacon- had the issue with the bend separating the bacon slice like in the article, so I expected that one. Overall, I was really happy with the result...when TSHTF and you pull out the bacon- life gets alot better. Thank you for the link to your published article. I too read it here first. My husband actually works at a pork plant so the next time they have employee meat sales I believe I know what I will be buying. You remind me of my mom, she would can everyday if she could find something to can. Would the masking paper be like kraft paper? Thanks for your time and sharing your life with us.